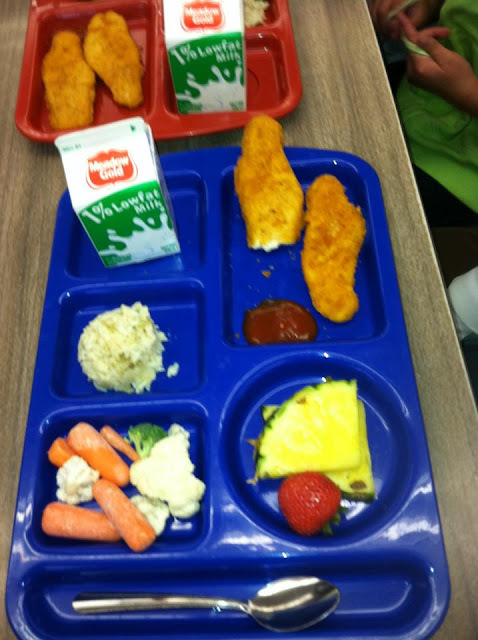 Contents: Chicken fingers, carrots, broccoli, cauliflower, strawberry, pineapple, milk, ketchup and (?)coleslaw. Notes: Looks great to me! Sure there are fried chicken fingers, but getting kids to eat means making some concessions. At least, that's how I feel. Besides, they aren't heavily breaded at all. That's a lot more veggies than when I was a kid!